Case IH's next generation of JX series tractors are ideal for small-to-medium sized farming operations and have the power to perform a wide range of tasks in a variety of conditions. With four models spanning the 60Hp to 90Hp bracket, the JX models boast a torque rise of up to 37%. The new models feature a number of benefits over their predecessors, including reduced noise levels, more comfortable operation and lower maintenance. Suspended pedals replace the through the floor clutch, brakes and foot throttle on previous models, delivering improved operation while clearing the floor of obstruction. "The brakes are hydraulically activated, bringing the benefit of reduced pedal pressure for more comfortable operation,” said Stuart Brown, Case IH Marketing Manager. Easy operation is delivered through the relocation of the mechanical hitch control raise/lower switch. The switch is now located alongside the draft and position control setting levers in a higher and easier to reach position, to the right of the driver’s side. Comfortable operation is further enhanced through a fully suspended, ergonomically designed cab, with a tilted steering column and wide operator area. “For maximum versatility, the JX’s simple and rugged gear box is fitted with a standard creeper speed allowing it to be operated at speeds as low as 0.2 km/h while still working at 2,500 rpm,” said Stuart Brown. 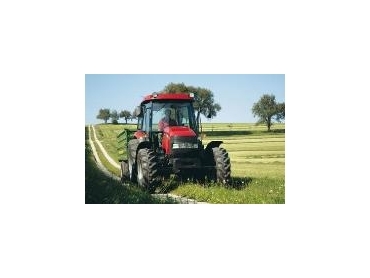 Operators can choose from three- or four-cylinder models in either two- or four-wheel drive. The JX70, JX80 and JX90 models are offered with a choice of air conditioned cabin or open operator platform with ROPS. All models are water-cooled and feature cross flow engine technology for low fuel consumption. “Plus, as an introductory offer while stocks last, we are offering a no-charge tyre upgrade on selected models,” said Stuart Brown. “For example customers may be able to upgrade from the standard radial 16.9 R30 tyres of the JX80 to 18.4R30 radial tyres at no cost - and that’s a great saving,” said Stuart Brown.